Apologies for the long silence, dear readers, as I have been away with limited internet connectivity. But I'm back now, and I'm catching up with life in general. An article of interest I found is the winner to Salon's Kitchen Challenge involves telling one's life in puddings. Pretty neat. But what constitutes pudding? The definition seems a bit fluid. In British parlance, pudding is basically another word for dessert, so any sweet item served to finish a meal is pudding. On the other hand, the concept of the dish called pudding seems to fall into two camps. One, such as bread pudding involves saturating and embedding a carbohydrate source into a custard base, and cooking it. Such puddings range from cake-like consistency, to spoonable and liquid. 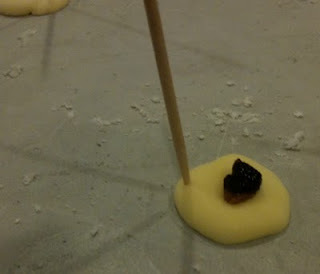 A second concept revolves around the latter consistency, simply thickening a liquid until it mounds and can be spooned. Some modern interpretations of that eschew the use of milk altogether, and can be built from almost any liquid and an appropriate gelling agent. Most basic boxed puddings, for example, is simply cornstarch thickening milk plus flavorings; an Anglo view of the Mexican atole. Such as, for example, from the culinary maverick Grant Achatz of Alinea. In the recent trip to the Great Western Casa McBardo, we tried to replicate perhaps one of the simplest dishes in the Alinea cookbook: a wafer of mango, soy, sesame oil, and fish flakes. Which looked simple enough until it required an antigriddle. What's an antigriddle? It's a flat surface cooled to well below the freezing point of water, so that ingredients can be frozen quickly, rather than heated quickly as it is the case of a regular griddle. 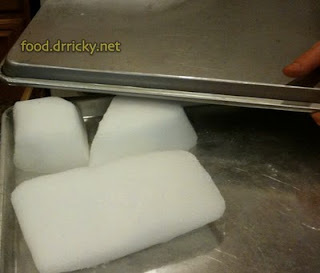 We improvised, making one from a pair of sturdy baking sheets, an amount of crushed dry ice, and a cooling rack to raise it from the counter surface to avoid damaging it. To make it, we took mangos, and pureed it, and adjusted with simple syrup so that it is the right consistency to freeze quickly. I forget the Brix number, but we didn't know it exactly - we just dropped bits on the improvised antigriddle. Then came the pudding - a pudding of soy sauce. It's soy sauce that was gelled using agar, and then run through a blender to produce a pudding consistency - an increasingly common technique to produce puddings from anything from rosewater to wine. The recipe called for but a drop per wafer, but the amounts prescribed seems to be large. We found out why - you can't run a small amount through the blender...never mind piping it through the squirt bottle. Assembly involves making a donut shaped puddle of mango on the antigriddle, then a drop of sesame oil in the hole, and finally a plop of soy pudding. Then a dusting of fish flakes in the form of katsuo boshi - dried bonito - prior to service. The toothpick is there as a handle to pick up up the wafer without melting it in your hand (Alinea has these specially designed toothpicks for this). You know, despite the odd combination of ingredients, it works. The layered freezing results in layered flavor progression, from sweet to salty to umami. One funny anecdote, BBQ Dude of Indirect Heat grabbed the very first wafer off the assembly line, and popped it directly in the mouth - and froze off a patch of his tongue as the incredibly cold wafer stuck to it. Visions of licking a frozen flag pole. So, if you're attempting this at home, be forewarned.